As Easter approaches many plant lovers decorate their homes with holiday-themed plants. 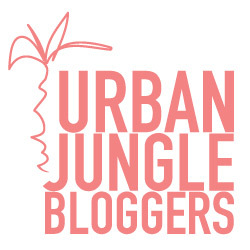 If you need some plant inspiration , check out the Urban Jungle Bloggers community for Easter plant decorating ideas. The UJB theme for March was ‘Happy Green Easter’ which was about styling this Easter with plants. Well, I found the perfect plant for my coffee table this Easter. If you like to collect holiday-themed plants, or unusual plants then I am certain you will love it too. 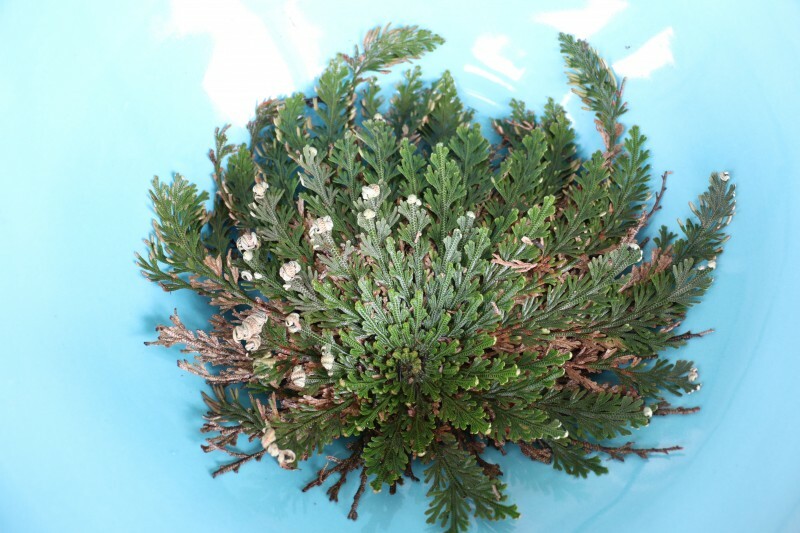 The plant is Selaginella lepidophylla, aka dinosaur plant, stone plant, resurrection plant or [False] Rose of Jericho. This plant is aptly termed the resurrection plant as it appears to rise from the dead when given water. This theme of Resurrection is in keeping with the celebration of Easter for Christians all over the world, and thus makes it a great decorative plant for the Easter holidays. FYI, Selaginella lepidophylla popularly known as the Rose of Jericho is apparently not the True Rose of Jericho. 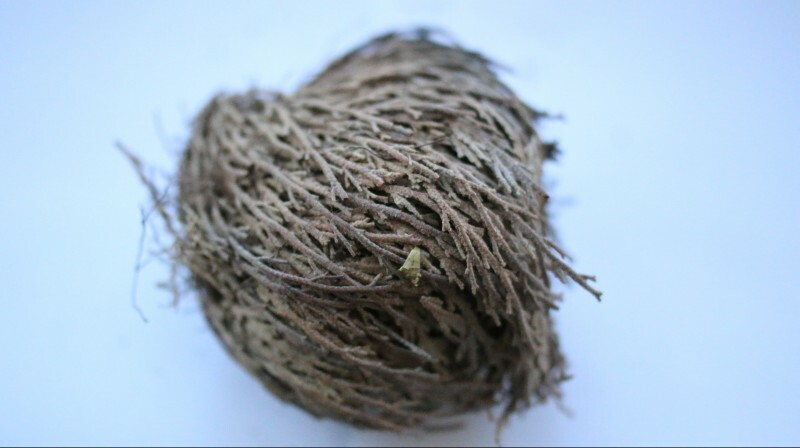 The True Rose of Jericho is Anastatica hierochuntica, a native plant of western Asia, but is not the focus of today’s post. 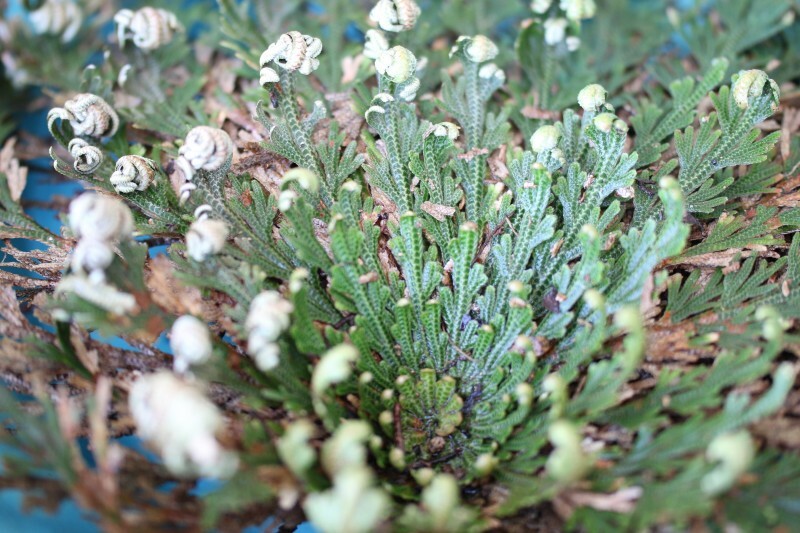 Selaginella lepidophylla, is native to the Chihuahuan desert which span across Mexico and the United States. Resurrection plants are just as their name implies; they go dormant in times of vegetative desiccation (extreme dryness to the point of tissue dehydration) and are able to resume growth and metabolic activity upon rehydration1 or in other words ‘revive’ in wetter conditions. This gives them the ability to withstand many years of drought. S. lepidophylla is a spike moss, which in actual fact is not a moss at all but an ancient vascular plant closely related to ferns. Spike mosses need constant moisture to stay green. 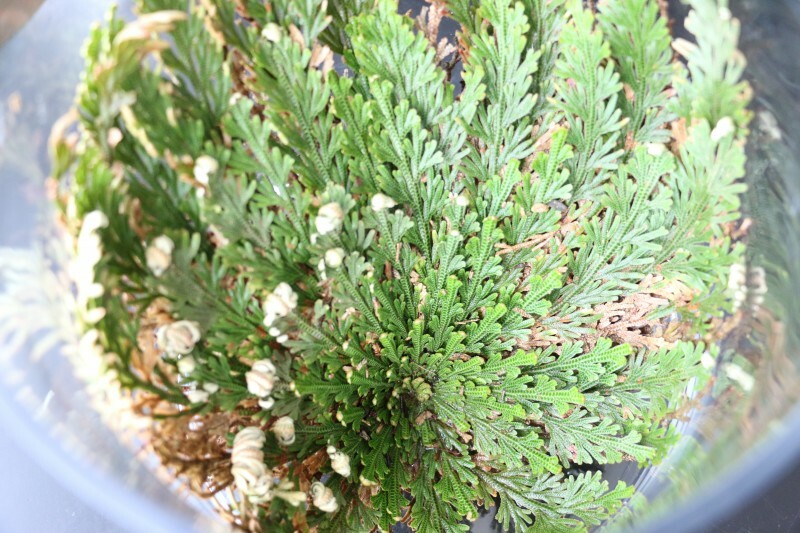 In its hydrated state, this resurrection plant is green with spirally arranged stems that lie flat and stretched out. When it becomes dehydrated, it turns brown and the stems tightly curl into a ball about 6-8 cm. It does this to limit light and thermal damage to inner stems and tissues 1 which would in turn hinder rapid photosynthetic recovery should water become available 2,3. In their natural habitat, during dry periods, they can retract their roots to be blown by wind like tumble weed until they land at a damp place where they can continue to grow and spread. My plant arrived in its dehydrated state and was about 8 cm in diameter. I filled a bowl with about 2 cups of water and placed the ball inside. The plant opened up slowly over several hours. I had to add more water to the bowl to make sure the whole plant was covered before it started to turn green. I have included a short time-lapse video below for your viewing pleasure. The video shows the transformation of the plant over the first 7 hours. It took about 24 hours for the plant to completely open up and look like the one below. In its hydrated state my plant spans 22cm. What a transformation in size! During my research I stumbled on a forum where a few people stated that these plants being sold as resurrection plants are actually dead and not just dormant as they do not appear to be growing. Apparently even when they are dead, these resurrection plants will unfold as cells that are rehydrated expand in the absence of a living protoplasm. Though this is true, I don’t think dead plants can turn from brown to green, so if you purchase one and it doesn’t turn green, it is likely dead. But before you come to that conclusion, if the plant does not turn green after adding 1-2 cups of water, add some more water as it may be more thirsty or large needing more water (according to the info card mine came with). 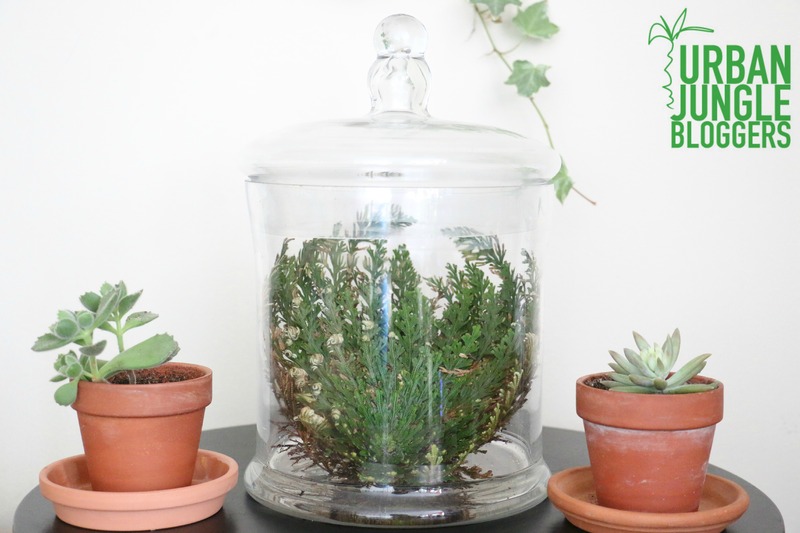 Once the plant is rehydrated, you can choose to keep it open by providing constant moisture (like can be found in a terrarium) or let it dry out and return to its curled up state. I am keeping mine in a terrarium for now and will probably let it dry out at the end of summer. According to the info card the plant came with, this plant is sometimes used as an engagement gift with the ring placed inside and once the plant is open, the engagement ring is exposed – pretty neat idea, but I guess the girl would have to wait for 24 hours before seeing that ring! Also, because this plant does not die, it is traditionally passed down through generations. I wonder if I can keep this plant long enough to pass it down to my children! Whether dead or alive, this plant is quite fascinating. Any of you have a Resurrection plant? Share a picture of your plant or your experiences below. Until the Next Green Obsession, Happy Easter! How do you plant it in soil and how does it fare while in soil? Would it be better to have it sit on rocks instead of potting it? I just bought one and I’m looking forward to reviving it! It did unravel and it is not very large, but the colour doesn’t look anything like yours… Does this mean mine is dead? I am not really sure Tracy. 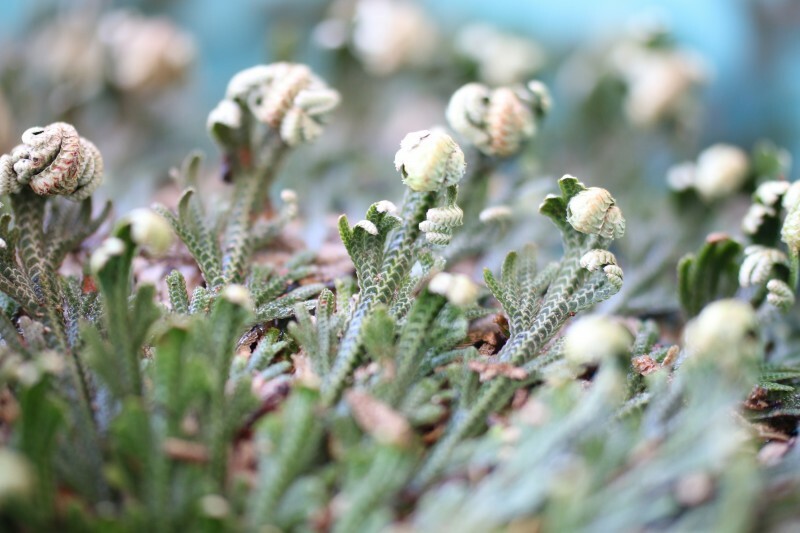 It may be a different plant, as there are a few species that are all called resurrection plant. It could also be dead. Where did you get it from? Perhaps the person who gave it to you may be able to give you more information. All the best. I am from Hong Kong and can never saw this kind of plant. Yes it is pretty huge. I kept it in the terrarium for a few days but it began to grow mould so I knew I had to plant it in an actual pot and soil. Since I’m running out of space for plants, I let it dry up again for now. I just discovered you tumblr page this morning through Instagram and I’m happy to have found another person passionate about plants. Thanks for stopping by Daryl. This is a truly amazing plant! It’s perfectly symmetrical in its opened up state. Where did you get it? I live in Canada too and I want one. I’m glad you like it. I got it from canadianairplant.com. A fascinating plant! My sister gave me one when I was a kid and I rehydrated it several times. I don’t remember what happened to it after that. I like your idea of letting it grow in soil for a while as it must need that from time to time. Your time-lapse video is cool! How did you do that? I actually just placed the plant in shallow water in the terrarium, without soil. Although now thinking about it, letting it grow in soil as it would in its natural environment is a good idea. For the time lapse video, I had a camera on a tripod and set it to take pictures at variable intervals over 7 hours. Once it was finished, I used a software called VirtualDubMod (for PC) to put the pictures together to make the video (15 frames/second). On a Mac computer you can use the software called Time Lapse Assembler. I hope that helps.